Poker is a test of wit, strategy, and out-bluffing players like the Wicked Witch of the West. Well at least that is the goal in the Poker Free iPhone app. 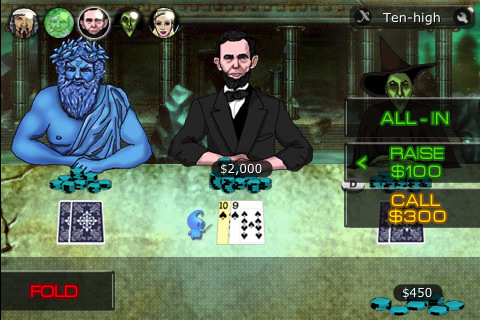 In this game you will be able to play against some wild characters including Dorothy, Abraham Lincoln, and even the Tooth Fairy. There is never a dull moment when you are playing the Poker Free iPhone app. This game takes the classic game of poker and spices it up with some fun AI opponents and a fun table setup. You will have the ability to look around the table and try to size up your competitors. You will love their animations and their unique personalities. As you try to master Texas Hold ’em, you can enjoy a quick history lesson as well. Each of the players personalities are reflected in their style of play so you will have to figure them each out in order to know if they are bluffing or not. Go big and throw it all in on the Poker Free app for the iPhone! Hey it’s free and it’s fun, what more could you ask for? Voted 3 stars by iPhone app users and is currently free to download.